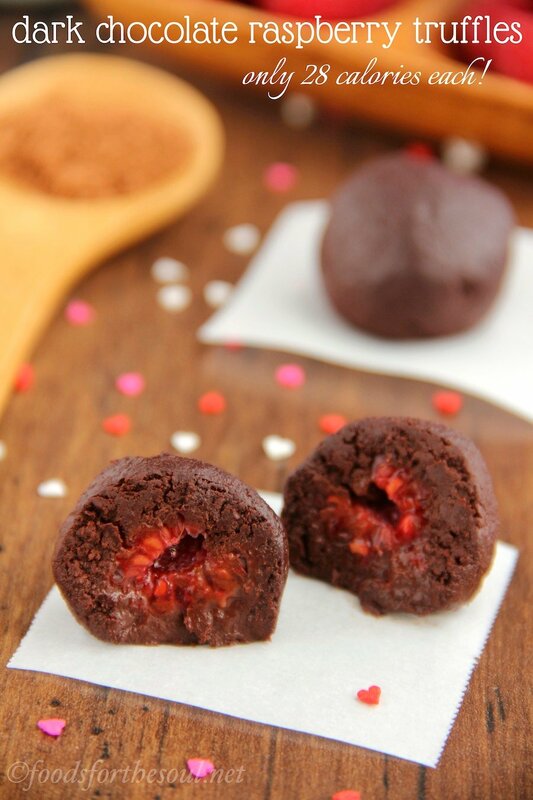 Rich luxurious truffles with a juicy raspberry center. 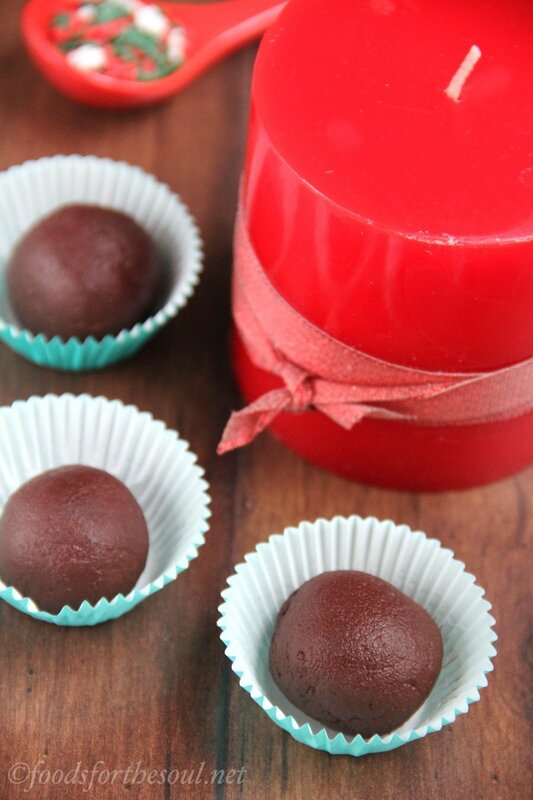 An easy 5-ingredient recipe for skinny, guilt-free candies! My guy and I nearly skipped our first Valentine’s Day together. It was my senior year of college, and my Pharmaceutical Chemistry professor forgot to check her calendar before scheduling our one-and-only midterm of the quarter for February 15. Without any homework assignments for padding, that single exam dictated almost half of our grade, so I spent the entire day before glued to my chair at the dining room table, papers sprawled out across the surface, pencils and colorful highlighters in hand. As I silently memorized my painstakingly recopied notes and worked through 8 chapters of suggested textbook problems, my guy drove across town to Trader Joe’s, fighting through the crowds of college kids loading their carts with Two-Buck Chuck. He arrived back at my apartment around dusk and quietly commandeered my kitchen as I meticulously drew out mechanisms. A quick aside… My guy actually hates cooking and practically avoids it like the plague. When we first started dating, he ate almost all of his meals out, and on the rare occasion he stayed home, he microwaved a frozen entrée instead. Aside from bottles of ketchup, mustard, and soda, his refrigerator looked as barren as the day he moved in! He also dreads washing dishes more than cooking. Before I came along, he’d let the plates and cups pile up next to his sink over the course of an entire month, and after he finally used the last fork and spoon, he’d don rubber gloves to vigorously scrub away the grime. I immediately volunteered for kitchen duty just to ensure I’d always have a clean set of silverware at his place! Despite his carnivore-style diet (meat, potatoes, and more meat), he created a completely veggie-centric Valentine’s Day menu for me. As I paused and shoved my papers to one side of the table for a study break, he brought over two bowls of homemade salad—dressing on the side, the way I always order it!—and a platter of steamed artichokes. After slowly savoring the greens, he plated two servings of spinach ravioli, topped with extra tomato sauce (my favorite part of any pasta dish!) that he doctored with fresh rosemary and oregano, plus a side of oversized slices of soft artisan French bread for my carb-loving heart. Cutest Valentine’s Day gift ever. To finish off the evening, he cleared away the dishes and, due to my dysfunctional dishwasher, picked up the sponge to wash every one by hand. As the pots and pans dried in the sink, he wiped down the countertops and stove, placing the leftovers in Tupperware and back in the fridge, until the entire kitchen looked as spotless as before he arrived. 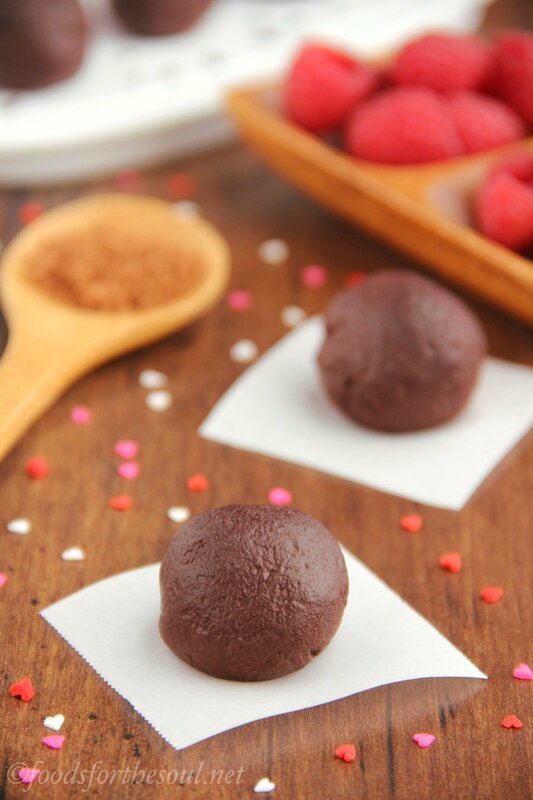 Just like that special Valentine’s Day, these truffles include a sweet surprise—fresh raspberries! The juicy centers contrast beautifully against the smooth dark chocolate coating, and each oversized candy only contains 28 calories. That’s less than a single Reese’s miniature peanut butter cup! 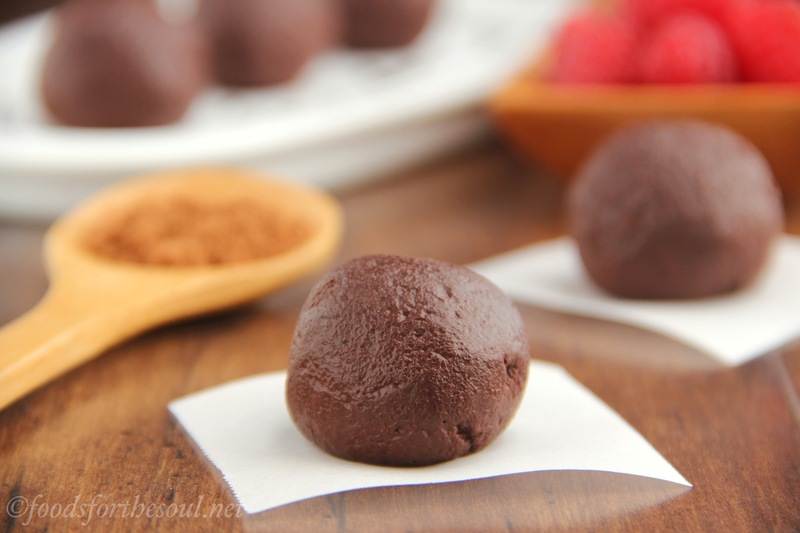 Moreover, these Dark Chocolate Raspberry Truffles fit into virtually every diet: clean-eating, paleo, vegan, gluten-free, dairy-free, chocoholic… Yes, chocoholism counts as a diet. Trust me; with how often I indulge, I practically define it! 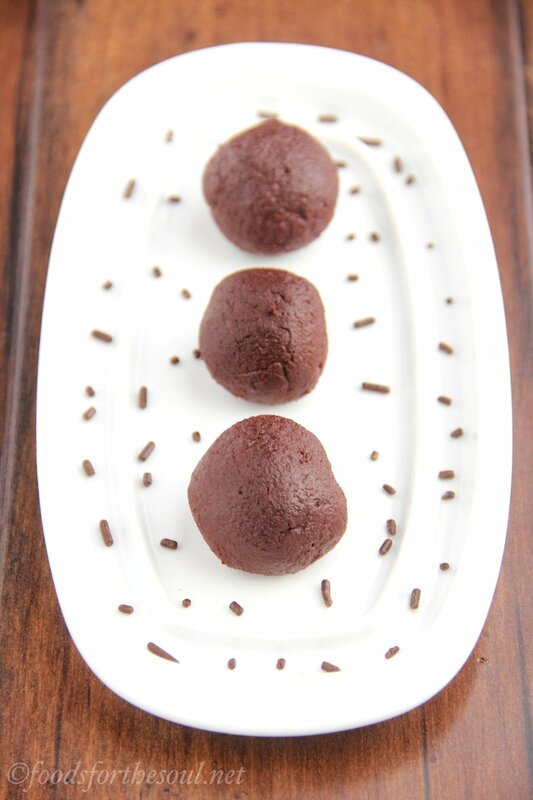 You only need 5 ingredients for these sweets, most of which you already own! Cocoa powder, applesauce, honey, vanilla, and raspberries. Just like with my other peppermint truffles, you cannot taste the applesauce! It simply acts as the glue to hold the truffle together instead of calorie-laden heavy cream. 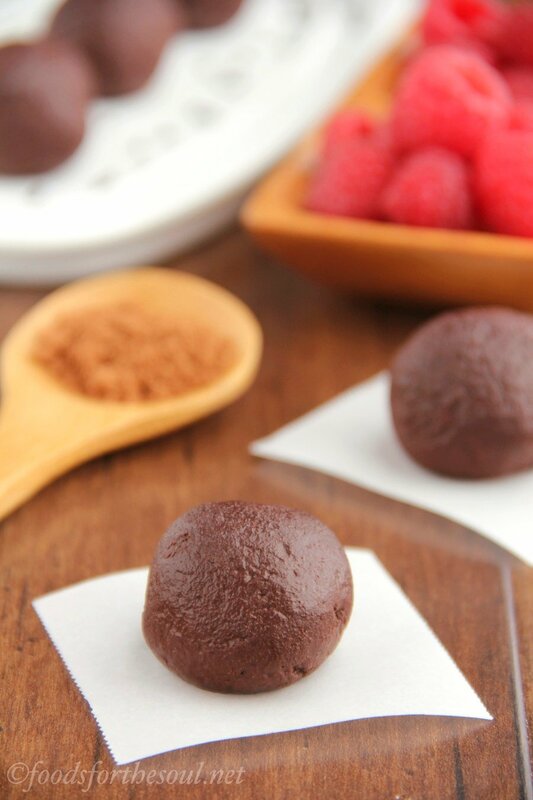 Note: For vegan truffles, substitute agave instead of honey. It won’t affect the taste or texture. Put away your stovetop pots and double boilers—unlike regular truffles, these skinny ones don’t require heating because they don’t use cream! Just add everything except the raspberries to a bowl and stir until combined. Seriously, it’s that easy. Then pop the bowl in the fridge to chill for at least an hour, or up to a few days. Do not skip the chilling step. The mixture will be pretty tacky after you first finish mixing and sticks to your hands if you try rolling it into balls. I shaped mine after only 30 minutes in the fridge, but a fair amount still clung to my palms after shaping the lot. Oh well, more for me to lick sample, right? 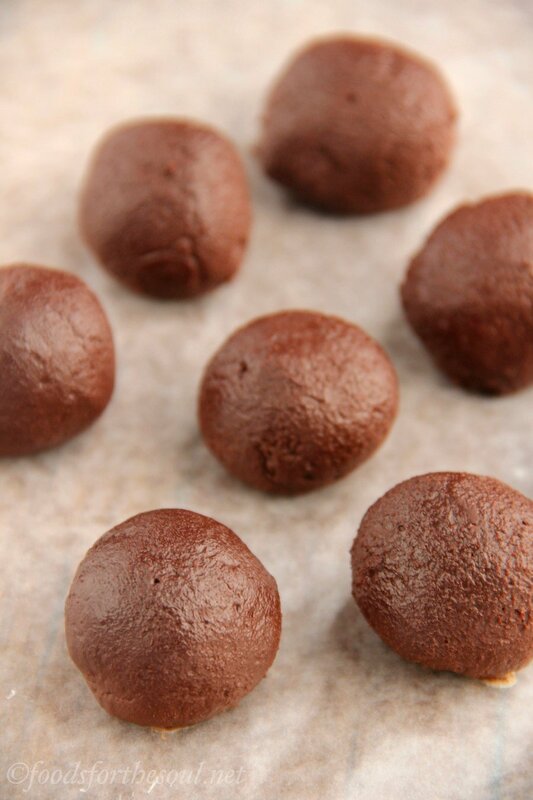 To help the truffles maintain their round shape, leave them in the refrigerator until ready to serve. Chilling also really brings out the raspberry flavor; its sweet fruitiness positively shines and they taste even juicier! 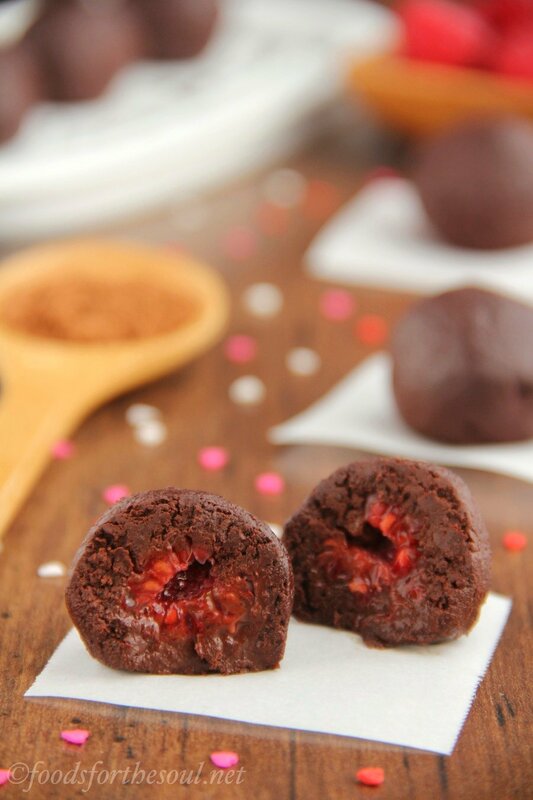 With their deep luxurious outsides and bright berry centers, these Dark Chocolate Raspberry Truffles possess the sinful decadence of See’s candies and Godiva chocolates—but none of the guilt! 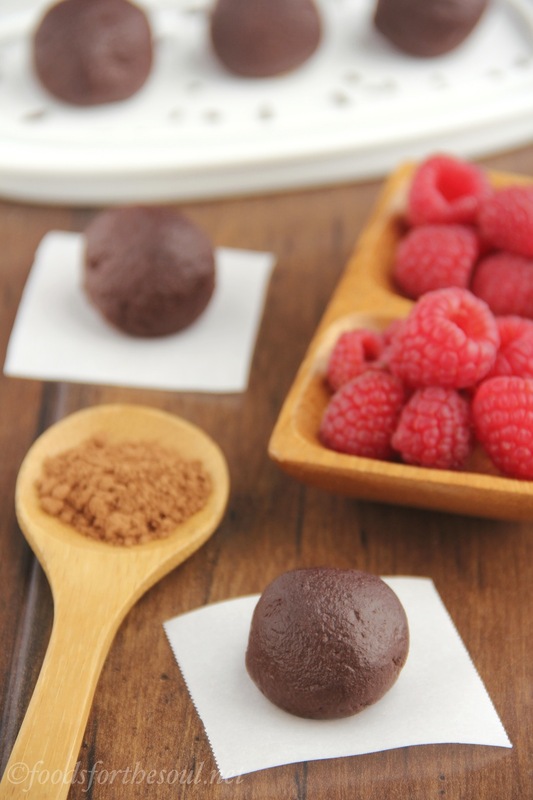 Each oversized truffle contains just 28 calories, compared to the 80+ calories in each one of the brand-name treats. 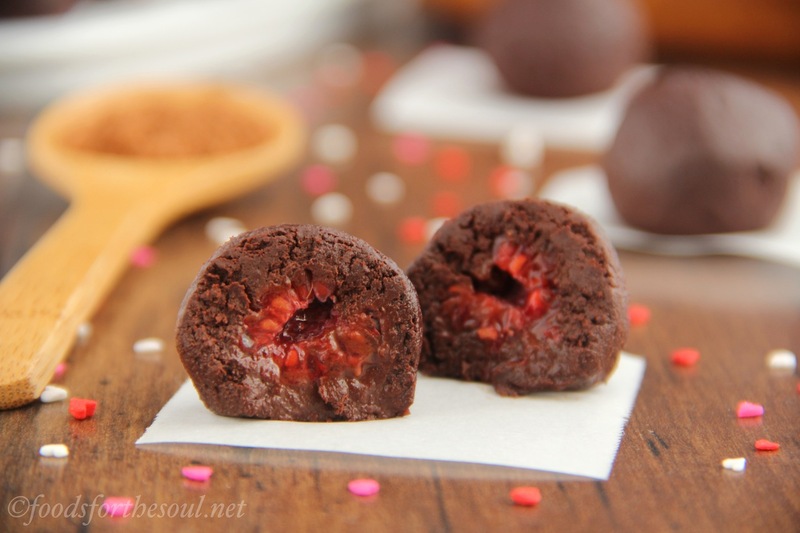 With only 5 simple ingredients, they’re perfect for Valentine’s Day, anniversaries, or any “just because I’m a chocoholic” day. Which is basically every day in my book! These truffles are incredibly rich and very dark. They don’t taste healthy at all! 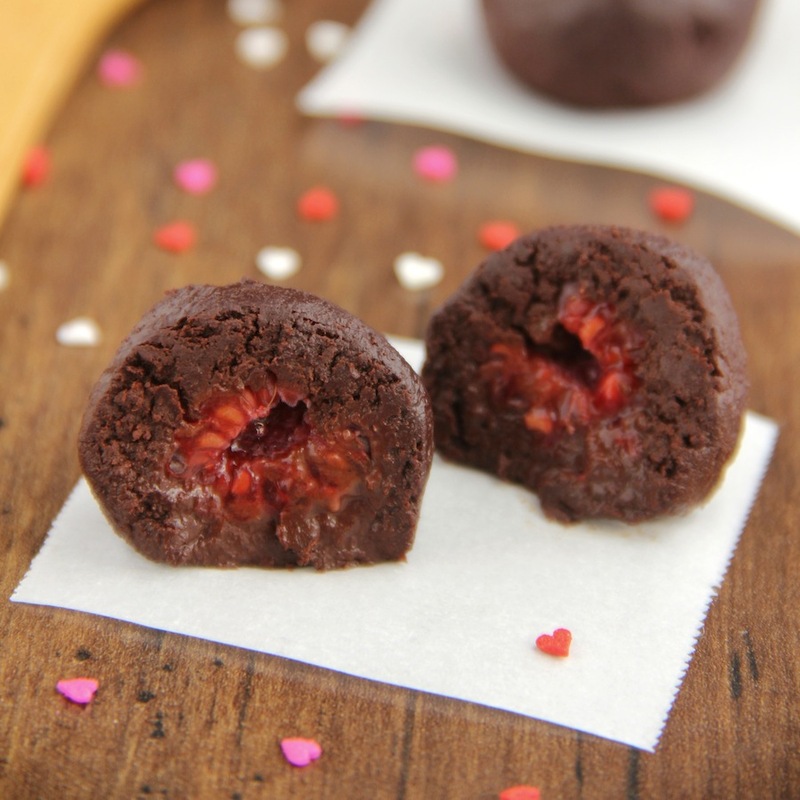 They’re the perfect treat for Valentine’s Day, anniversaries, or any “just-because” occasion. Leave the truffles in the refrigerator until ready to serve; it helps maintain their shape and really brings out the bright fruity flavors! I’m so sorry Jamiella; that must have been really disappointing! I used regular smooth unsweetened applesauce, regular unsweetened cocoa powder (not Dutched), and generic honey that comes in a squeeze bottle. I didn’t used a mixer, only a fork. If your honey was slightly more liquidy and not quite as thick, that could’ve done it. 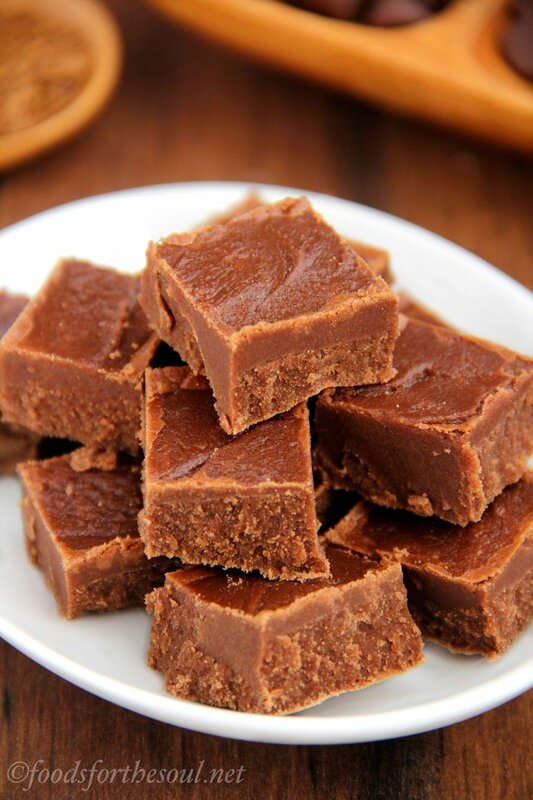 You could also try adding an extra tablespoon of cocoa powder to help thicken it. I’ve left the cocoa mixture in my fridge to chill for up to 3 days (I accidentally forgot about it! ), and it really stiffened up after that time. It also helps to help it stiffen faster if you press it down into a thinner layer at the bottom of the bowl. Hopefully your next batch turns out perfectly! What a great guy you have. 😉 That would be my favorite dinner ever! And then you got a A on your exam to top it off. Amazing! 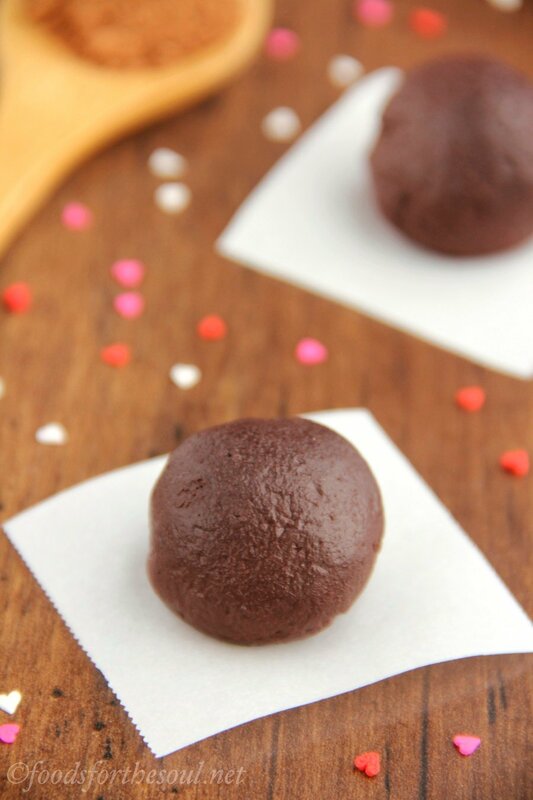 😉 Just like these truffles. That raspberry in the middle is perfect. Love! 😉 Pinned. My parents are coming to visit this weekend and I wanted to make something sweet for them so I tried these and love it! I had to use grapes instead of raspberries because my mom is allergic but the taste is great nevertheless ? The mixture turned out perfectly and was easy to fold around the grapes. I put it in the fridge again for 10 minutes or so again after I had made half of the truffles, that made it even easier. Now the only problem will be not to eat all of them before my parents arrive tomorrow ? I’m so glad you enjoyed the truffles Katja! 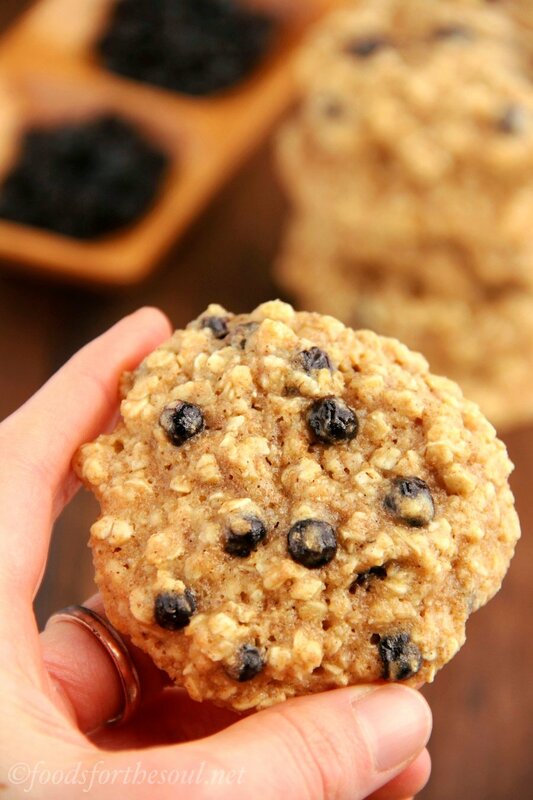 That’s so sweet of you to make your parents homemade treats — and especially sweet that you tweaked the recipe to make sure your mom could enjoy them too. Both of your parents are lucky to have you! 🙂 I hope you have a wonderful visit with them this weekend! I’m not a big fun of honey flavor, what amount of sugar would I have to put instead? I promise you can’t actually taste the flavor of honey — just really rich dark chocolate flavors here! 🙂 If you still prefer to substitute for it, I’d recommend pure maple syrup or agave instead. I can’t wait to hear what you think of the truffles Anna!